iText 5-legacy : Can I change the page count by changing internal metadata? Where can I read more about the internal structure of a PDF document? Some days ago I started to play with the internal structure of PDF document. While searching the internet, I've found some nice tools to edit the metadata, so far I haven't found how (and if) I can edit the page count in a way it won't affect the way the PDF is visualized. Can I change some metadata field, so that I can see a "fake" page count? If so, how is it done? Where can I read more about the internal structure of a PDF document? The page count isn't stored anywhere inside a PDF, hence you can not set some value to fool people into believing that there aren't as many pages as there are. You can read more about the internal structure of a PDF document in ISO-32000-1, but if you prefer a more practical approach, please download iText RUPS and take a look at the internal structure of a PDF. As you can see, the /Catalog dictionary (aka the root dictionary) of the PDF file has an entry named /Pages. This is the root of the page tree. 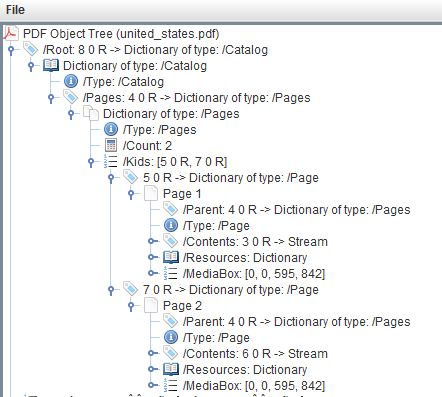 This /Pages entry has /Kids that can either be another /Pages dictionary (a branch of the page tree) or a /Page dictionary (a leaf of the page tree). In this case, we see two /Page elements. A PDF viewer will traverse through the page tree and count the number of /Page dictionaries to calculate the total page count. If you want to change the page count, you can remove /Page dictionaries, but that will also remove the pages. You can add /Page dictionaries, but that will add pages. The number of pages of a document isn't stored in metadata, hence your question to change the page count by changing some metadata is not a valid question. Is support license agreement mandatory?